Did you get yours?, a photo by aviva_hadas on Flickr. Did I tell ya'll that I got mine? DSCF4738, a photo by aviva_hadas on Flickr. DSCF4739, a photo by aviva_hadas on Flickr. DSCF5136, a photo by aviva_hadas on Flickr. Ahem, he stuffs as many goodies as possible into that bag. old cell phones (plural) cat toys, rubber duckies, Mr. Potatohead's glasses, & the stuff that came in the bag. DSCF5144 a video by aviva_hadas on Flickr. I have 3 brands on my shelf. DSCF5142, a photo by aviva_hadas on Flickr. Yes, those are Mr. Potatohead's glasses. DSCF5141, a photo by aviva_hadas on Flickr. Well I finished this top & then realized that it is too long. Seriously. So I removed 4 rows & while it wasn't "too narrow" it could "take" an extra column or two - so I took apart the rows & am in the process of turning them into columns. This is pretty much the look that I was going for - light. The piecing is random, the pattern is by Weeks Ringle & Bill Kerr of Funquilts & is in their book, The Modern Quilt Workshop. I would never hesitate to suggest adding that one to your quilt book library. Softly Spoken (Pattern called Plain Spoken by Funquilts in their book), a photo by aviva_hadas on Flickr. My little helper., a photo by aviva_hadas on Flickr. We are surviving Irene. We still have electricity & so far it just feels like a rain storm. Which is just as well, because I was not alone as I sewed. DSCF4913 a video by aviva_hadas on Flickr. DSCF4898 a video by aviva_hadas on Flickr. DSCF4923 a video by aviva_hadas on Flickr. DSCF4944 a video by aviva_hadas on Flickr. There was an apparent school group watching this, they made such a noise, that we went in the out door to see what was happening. Yes, my little sleeper is holding onto "Bunny." Yes, my little sleeper is holding onto "Bunny. ", a photo by aviva_hadas on Flickr. I don't see him in this state often. I am at the office before he wakes most days, & on the weekends, he is "up" when we enter his room. The flash did not wake him... (& I got a second shot after this one.) But the mommy kisses did. Meat Sauce, It's What's for dinner. Meat Sauce, It's What's for dinner., a photo by aviva_hadas on Flickr. brown meat & onions, add garlic once the meat is no longer pink & the onions are soft. Add the tomatoes & spices, stir & simmer on low heat. (Until heated through or as long as you wish) serve over your favorite pasta. Freeze the leftovers. IMAG0049.jpg, a photo by aviva_hadas on Flickr. Working from home today - & I have help. No, not a direct result of the earthquake. (Thanks again to all who checked in on us) They let us out at 2:30 - I get off at 2:30 anyway. Yes, I have that kind of luck. DSCF4948, a photo by aviva_hadas on Flickr. Oatmeal Toffee Chip, a photo by aviva_hadas on Flickr. I baked these on Friday for my sew-n-tell meeting on Sunday. Between noshing over the weekend, sew-n-tell & lunches this week, they are all gone! SewCalGal is hosting this one. On a finished I SPY. On a UFO - yes it still is a UFO & I have no idea why. On my French General Quilt. On an all batik quilt. (I'm not into batiks anymore, so I can't say that very much.) Yes, he is a very patient cat, my son was 8 months old in that photo. It's been a while since I blogged in blogger - some funny mishaps happened on the way to "Publish Post" I'll leave them to your imagination. DSCF5094, a photo by aviva_hadas on Flickr. I always like blue & yellow quilts. Always. DSCF5090, a photo by aviva_hadas on Flickr. DSCF5086, a photo by aviva_hadas on Flickr. Need an idea on how to use your stripes? I have some stripes, but I am thinking about doing a different Kaffe inspired quilt with them. DSCF5075, a photo by aviva_hadas on Flickr. DSCF5047, a photo by aviva_hadas on Flickr. Just a scene from the fair. DSCF5118 a video by aviva_hadas on Flickr. DSCF5032, a photo by aviva_hadas on Flickr. DSCF4980 a video by aviva_hadas on Flickr. DSCF4775 a video by aviva_hadas on Flickr. The quilt was a baby gift. DSCF4801, a photo by aviva_hadas on Flickr. DSCF4809, a photo by aviva_hadas on Flickr. DSCF4811, a photo by aviva_hadas on Flickr. DSCF4815, a photo by aviva_hadas on Flickr. My favorite quilt from the fair. DSCF4593, a photo by aviva_hadas on Flickr. One of the miniatures. 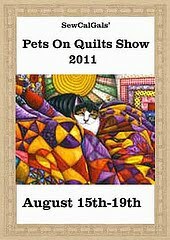 This was hte first quilt that I looked at & I knew that I would like the show after seeing it. DSCF4596, a photo by aviva_hadas on Flickr. DSCF4621, a photo by aviva_hadas on Flickr. DSCF4624, a photo by aviva_hadas on Flickr. Ever since I started quilting some dozen or so years ago, I have wanted to piece a quilt & add an applique border. More often than not recently, I have been eliminating borders instead... I guess I have to wait for the pendulum to swing back. Bunny & Sheep a video by aviva_hadas on Flickr. v'shamru a video by aviva_hadas on Flickr. IMAG0024.jpg, a photo by aviva_hadas on Flickr. DSCF4689, a photo by aviva_hadas on Flickr. This one was made by one of my favorite quilters. I made a set of her quilts... She has done others that are not in this set. DSCF4655, a photo by aviva_hadas on Flickr. I like this one too - so much so that I took about 30 photos of it! DSCF4634, a photo by aviva_hadas on Flickr. DSCF4632, a photo by aviva_hadas on Flickr. the numbers involved in my favorite. DSCF4631, a photo by aviva_hadas on Flickr. Detail of the back of my favorite - couching & appliqueing over the quilting. DSCF4630, a photo by aviva_hadas on Flickr. DSCF4629, a photo by aviva_hadas on Flickr. DSCF4623, a photo by aviva_hadas on Flickr. Ya'll knew I went to a quilt show, right? Here is the Best in Show. I'll share more tomorrow. IMAG0018.jpg, a photo by aviva_hadas on Flickr. The Rx shampoo has an ingredient that is supposed to help with his "scabs" - he has allergies & the "hives" on a cat are like scabs, that flake off - with the fur, so he is generally far from pretty. Museum of Natural History, a photo by aviva_hadas on Flickr. The museum was sensory overload for the toddler. So much to see so close.